"Look, Mom. The cheeseballs are waiting their turn in line to go roll in the dirt." Making food through fermentation takes awhile. And even though you can ballpark how long the process will take, you can't predict exactly when it will be done when you start. Take, for example, the Shankleesh we have just put up to age. This is the second recipe we undertook from David Asher's The Art of Natural Cheesemaking (White River Junction: Chelsea Green, 2015). We started this cheese last Tuesday, and we just put it up to age today, a couple of days later than anticipated. The recipe for Shankleesh calls for extra firm and dry Dream Cheese, which is explained earlier in the book. Dream cheese is basically cheese made from yogurt that you hang in cheesecloth until the whey has drained out. I actually remember making yogurt cheese as a kid, back when the goal was low-fat everything. Yogurt cheese promised to be a low-fat cream cheese, and we tried making it. The day the yogurt took to drain seemed never-ending, and when it was finally time to taste the cheese, I remember feeling a bit disappointed. After all of that waiting, the cheese tasted okay, but it was pretty tart, and not at all like cream cheese. We could have hung homemade yogurt to start our Shankleesh, but David proposed an alternative recipe for Dream Cheese, entitled "You Can't Do That With Pasteurized Milk Cheese." He wrote that it may be the oldest cheese ever made. We made that one, of course. We started with good raw milk,* which according to the recipe, should take about two days to clabber. "Clabber" is a word that doesn't come up much anymore, likely because most milk is now pasteurized, and you can't make clabber out of pasteurized milk. To make clabber, you leave raw milk out at room temperature, and the beneficial bacteria present in the milk will make the milk sour and thicken it into what's called clabber. Pasteurized milk doesn't work this way--it just rots at room temperature. Our first step was to pour our raw milk into a jar and let it sit on the counter. Then, we waited. We checked the milk every day, stirring with a spoon to check for thickening and to see what it smelled like. Every day, it started to smell a little bit more tangy. By Day 2, there was no clabber. Not on Day 3, either. By Day 4, I was starting to get impatient, and I wondered if the temperature of our kitchen was too cool. It was a warm day, so I put the jar out in the sun on the deck and in a couple of hours, we had clabber. First, love your microbes and the clabber they made. Pour the clabber into the cheesecloth. Tie up the clabber and set it to drain in a tall pot for a day. Get the curds ready to hang again for another day. Realize that at this point, the cheese and the cheesecloth smells pretty funky, so you'd rather that your mom do most of the cheeseball making while you get accustomed to the smell. 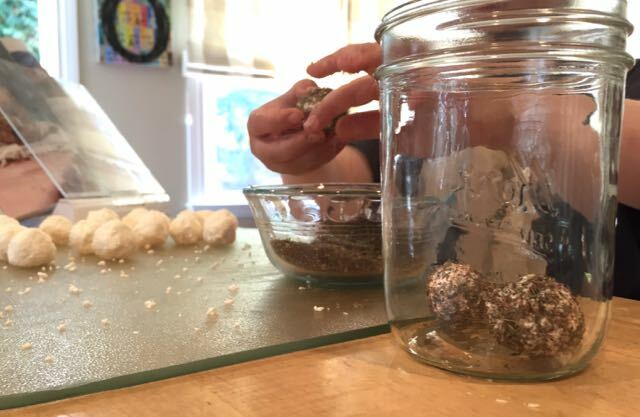 Dredge the cheeseballs in za'atar and place them in a jar. Fill the jar with olive oil. Place in sun for a photo before putting in the cool dark aging space in the garage. To make the cheese, we pulled out our cheesecloth (real cheesecloth, not the loosely woven stuff from the grocery store) and lined a colander with it. In went the clabber, and we suspended the clabber by a knot on a spoon balanced over a tall pot. After a day, the whey had drained, and we had curds. We salted the curds, and hung them again for another day of draining. Our next task was to form the cheese into balls and then dredge them in za'atar. I have to say, the cheese cloth had gotten pretty stinky by this step. Wyatt almost bailed on the project the smell was so pungent. The balls then went into a jar, and we covered them in olive oil. Our jar of cheese is now resting comfortably in the cool temperature of our garage, and it will stay there for a month. We put a sticker on the calendar so we can have a visual countdown to the day when we can eat it. Tom Petty and The Heartbreakers got it right: The waiting is the hardest part. *Raw milk, its history in the United States, and the politics that accompany any discussion of raw milk, are as fascinating as they are polarizing. Many states do not permit the sale of raw milk. Fortunately, California is not one of those states, and I've now got Rainbow Coop's delivery schedules of raw cow and goat's milk (the chapter on chèvre is coming!) so we can purchase the freshest possible milk to make our cheeses. You may heartily disagree with my decision to move forward with a project that requires using raw milk, and in this preparation, will almost certainly age for less than 60 days. Your hearty disagreement is fine with me. But please express it respectfully.